Bond is the number 1 provider of 11+ practice, helping millions of children improve their literacy and numeracy skills. 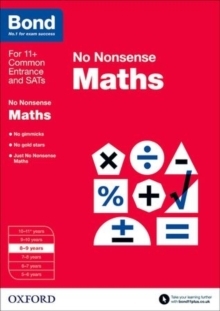 Bond No Nonsense Maths for 8-9 year-olds provides clear, straightforward teaching to help boost your child’s confidence and ability in Maths. Divided into separate lessons that cover each key skill, this book takes your child through a learning sequence designed to reinforce and advance school learning, and setting children on the right path for 11+, SATs and Common Entrance test success.